OPEN evenings for the new co-educational school in North Belfast are to be held this week. Trinity College, formed after the amalgamation of Little Flower and St Patrick’s College, will open its doors in September. The Somerton Road site will be the base for Year 8 and Year 9 pupils as well as Year 12 girls and Year 14 A-Level students. Preparations are well under way, with new Principal Jim McKeever already in position to ensure a smooth transition to the new school with ethos, curriculum and exam success all high on the agenda. “Trinity College will open in September 2017 to serve all of the community of North Belfast, Glengormley and beyond,” he explained. “The ethos of Trinity College will be based on care and meeting the personalised needs of each individual child in a loving atmosphere where all students are valued, respected and encouraged to believe in themselves. “The curriculum on offer has been designed to meet the personalised needs of each student and is aimed at developing students to become confident and fully participating members of society. “Preparing students for GCSE and A-Level is a very high priority within the college and we will provide additional support classes to cater for the needs of all our young people. “Exam performance will have a very high priority in Trinity College with all the modern strategies to be put in place to maximise performance including additional classes and Saturday openings. For now, the focus is on next week with Trinity College Open Evenings taking place at the Somerton Road site on tomorrow (Wednesday) and Thursday night. “Feedback from the community is one of genuine excitement about this new opportunity for North Belfast – a beacon linked back into the community is the dream for all involved. Trinity College wants to make North Belfast proud. 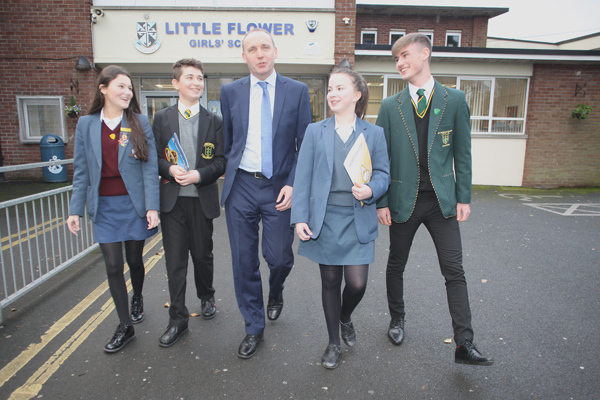 “I want to make this school the best in North Belfast, the people deserve nothing but the very best and that is what we are determined to give them. “We’ve been doing a lot of canvassing in the local community. The young people themselves are very excited about the open evenings next week. “Come along and enjoy the whole experience and don’t leave if any of your questions haven’t been answered,” added Mr McKeever. All P7 boys and girls and their parents are warmly invited to attend the open evenings. Principal’s address will be at 7pm each night followed by guided tours.